Alvaro Pierri is internationally acclaimed as a leading personality in the world of the guitar. Press reviews around the world praise “his masterly thought-out interpretations“… “the breathtaking phrasing“ … “his phenomenal and brilliant technique” … “the unmatched musical colour spectrum that he creates on the guitar“ . Popular with both the public and the critics, Alvaro Pierri is regular guest in major concert houses in Europe, North and South America, in India, Japan, Corea and China. His debut in the USA took place in New York and received outstanding reviews: “… Mr. Pierri revealed an artistic maturity not commonly encountered ” … “compared to artists as Segovia, Bream, Williams” … “brilliant, sensitive, versatile, breathtaking” (New York Times). In 1983 he made his debut in Germany with the string soloists of the Berlin Philharmonic; subsequently Alvaro Pierri appeared worldwide on numerous radio and television programmes (as a soloist but also together with artists like Frank Peter Zimmermann, Astor Piazzolla, Charles Dutoit and big Orchestras) produced by stations like Deutsche Rundfunk, PBS New York, CBC Canada, Radio France, NHK Japan, KBS Korea, Austrian, Spanish, French, Danish, Chinese Radios…. Contemporary composers such as Leo Brouwer, Guido Santorsola, Jacques Hétu, Astor Piazzolla, Abel Carlevaro, Carlo Domeniconi, Dusan Bogdanovic a. o. have written major works for Alvaro Pierri, in each case he has premiered them brilliantly. Alvaro Pierri’s CDs have been released by Metropole-Polydor (France), Blue Angel-2001 (Germany), Milan Records (Canada), Analekta (Canada), Amplitude (Canada), Madacy (Canada), HOMA (Japan), Pioneer Classics (Japan) and Alpha Omega (Hong Kong). His discography includes solo recordings, chamber music, guitar concerts and electro-acoustic music. Several of his CDs have been honoured with prices and nominations, he recieved already twice the coveted Canadian FELIX award for the best classical CD of the year. 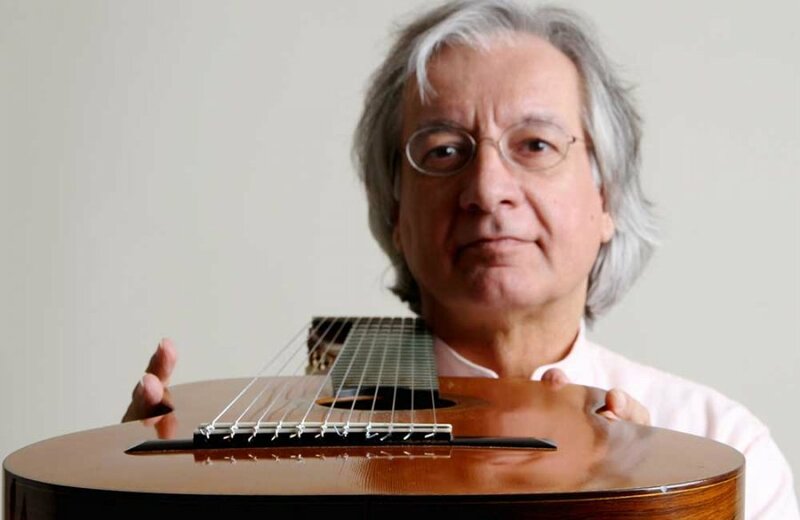 Recently „Pioneer Classics Japan“ brought out a DVD featuring Spanish and South American guitar music, and „Deutsche Grammophon“ re-issued a DVD, Alvaro Pierri performing in duo with Astor Piazzolla. Alvaro Pierri is also an internationally acclaimed teacher. Many of his students have won major international guitar competitions, and have themselves outstanding performing and recording carreers. He was professor in Brazil at the University of Santa Maria, later then in Canada at McGill University (Faculty of Music) and at the UQAM (Department of Music) in Montreal. In 2002 he was appointed professor at the famous Academy of music in Vienna (today University of Music and Performing Arts), Austria. Pierri gives master classes at major music festivals such as New York Manhattan Masters, GFA Guitar Foundation of America, Québec FIG, Orford Festival, Domain Forget (Canada), SIG Séminaire International de Guitare in Paris and Bordeaux, Barcelona, Sevilla and Elche in Spain, Rome, Mozarteum Summer Academy in Salzburg, Wiener Meisterkurse, LiGiTa Liechtenstein Guitar Week, Amsterdam, Kopenhagen, Helsinki, Uppsala, Villa Musica Mainz, Berlin, Koblenz, Iserlohn, Sao Paulo, Rio de Janeiro, Montevideo, Mumbai, New Delhi, Tokyo, Sapporo, Osaka, Seoul, Hong Kong, Beijing, Shanghai, a. o.
Alvaro Pierri was born in Montevideo in Uruguay, in a family of musicians. He received his early musical education from his mother, the pianist Ada Estades, and his aunt, the uruguayan guitarist Olga Pierri. Later he studied with the legendary Maestro Abel Carlevaro, the composer Guido Santorsola and also at the Uruguayan National Institute of Musicology. From the age of 11 he was already performing in concerts and winning prizes in international guitar competitions, including 1st Prize in the International Guitar Competition in Buenos Aires, Argentina, 1st Prize in the International Guitar Competition in Porto Alegre, Brazil, and the Gold Medal at the 18th International Competition in Paris. In recognition of his outstanding artistic talent and carreer and his permanent enriching contribution to music and culture, 2008 Alvaro Pierri was appointed as honorary citizen of his hometown Montevideo.